CRAZY RUMORS Natural Lipbalm Blueberry Lemon is a real treat for your lips thanks to its gourmet scent that reminds us of blueberry pie and lemon cream! Its formula rich in organic shea butter nourrishes and protects your lips, they are smooth and delicately fragranced. Crazy Rumors Lip Balms are 100% natural, cruelty-free (not tested on animals) and vegan (no animal-derived ingredient). 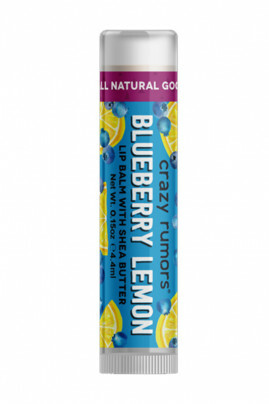 All the good taste of blueberry pie and lemon cream without the calories with Crazy Rumors Lip Balm!